I just baked a batch of oatmeal/raisin/nut cookies and 5 dozen rolls for a family dinner tomorrow. 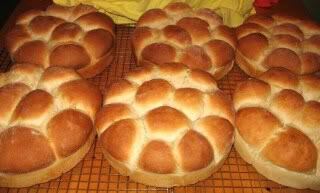 Tomorrow, I'll get back to reality and bake some bread. all i baked today was a sweet potato casserole to take to a dinner. last night i made a micro wave bread pudding. does that count? instead of milk i used half and half, instead of white sugar i used splenda's brown sugar. a little to sweet. will fix that next time, it was very tasty. Marigene, those rolls look amazing! I haven't posted here for awhile because I haven't felt like baking, but I am getting more in the mood as I feel better. I went out with some friends as one was celebrating her birthday and I made a chocolate raspberry torte. The "cake" was 8" layers of crisp cookie wafers which when layered with chocolate whipping cream and raspberry sauce, then chilled, became nice and soft. I then drizzled chocolate ganache on the top and the individual serving plates. It was a real hit and has gotten me in the mood to keep creating again! Wow, LPBeier, what a cake! Remind me to invite you to my next birthday party! OMG, will you please adopt me??? I promise I'll do dishes every night and cook every Sunday for you. Beautiful torte. Two loaves of NYT No Knead bread in the oven right now..to go with Sausage and Lentil Soup for lunch after church. Thanks, Russell and Joe you are too kind. Maybe I should hook up with FedEx?